Here’s an item I shouldn’t have for it just doesn’t fit my interest mix, but nonetheless, I like it. I have had occasion before, on this blog, to say I am not a bottle collector yet what we have here is another bottle. This is a handsome bit of glass and I think a quart sized bottle – 2 pints. It came from the ‘Anglo’ Brewery in Shepton Mallet. Now they, it seems, were renowned as the first brewers of lager in this country. I’m not anti alcoholic drinks but I rarely imbibe. And if I do it certainly isn’t lager which I really don’t like. But of course, I do like industrial history and this bottle represents a piece of that. By the way, the stopper I have in the bottle fits but doesn’t match. It’s a Wadworth of Devizes screw in stopper. Wadworth is still a very active brewery in my most local town. The Anglo Brewery, on the other hand, after a very successful period from opening in 1864 until 1914, is now long closed. With its emphasis on lagers it had been known as the ‘Anglo’ Bavarian Brewery and at the outbreak of WW1 in 1914 anti German sentiment was very strong and sales of the beer plummeted. The company removed the word ‘Bavarian’ from all products but it made little difference and by 1921 the business shut down. This bottle does not have the word ‘Bavarian’ on it and that suggests it dates from that 1914-21 period in the company’s declining years. The brewery building, a handsome edifice, still stands in Shepton Mallet. So, although I don’t collect bottles and dislike lager, I find this bottle has a fascinating history. I’ll start with a regular and heartfelt cry. I do not collect bottles. But I do rather like them and some have come my way and they do get kept. Here’s another example. 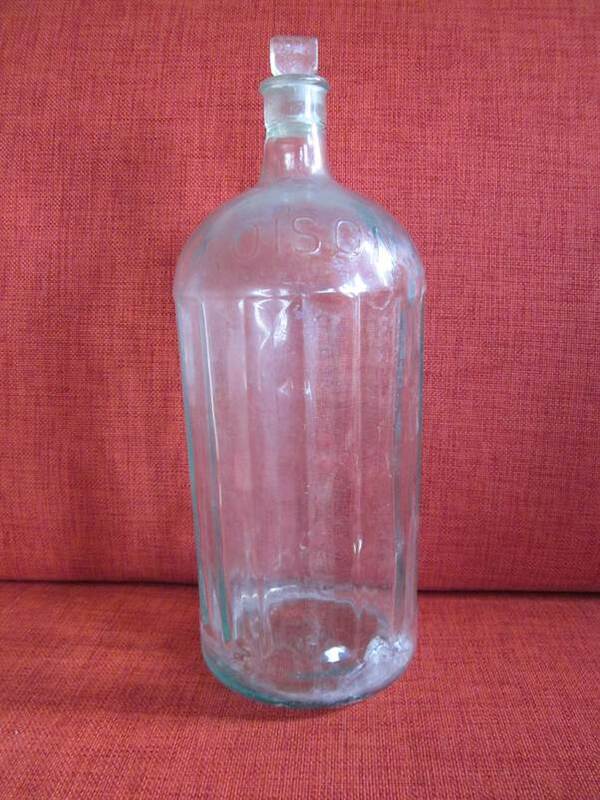 It is in a style known as a Codd’s bottle named after the designer of this container. And the contents – fizzy drink – was sometimes called codswallop. Actually, there’s no certainty that the word codswallop derives from the drink in these bottles. I think I must enjoy the challenge of photographing these see-through items. 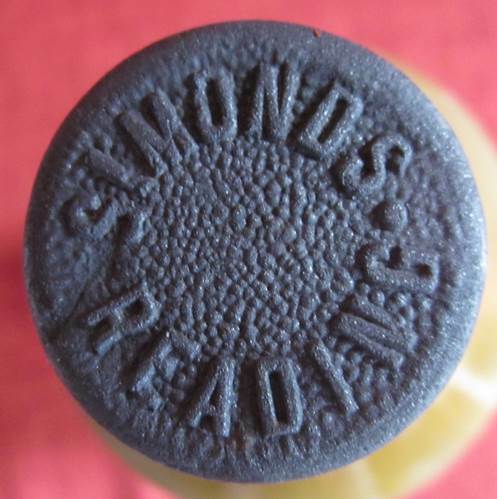 This is a mineral water bottle embossed with the marks of Allen and Lloyd of Aldershot. It’s one of those bottles held shut by the pressure inside the bottle against a ground glass marble trapped in the neck. You needed a pusher to push the marble further into the bottle to release the pressure so that you could get at the drink. The bottle opener might have been a wooden device like this one I snapped at a local museum. The firm of Allen and Lloyd came about in 1868 when Mr Lloyd joined Mr Allen’s existing business. I think the bottle could be 100 years old. The other side of the bottle tells us about its manufacturer. Redfearn Bros, Bottle makers of Barnsley. As far as I can make out they opened for business in 1910. I do like the cleverness of the design and the reusable nature of the bottle. By comparison with re-using, recycling glass seems almost criminal. Just think of all the energy needed to melt down old bottles and reform them into new ones. Poison is what this bottle says in big letters. But one has to say it may not meet today’s health and safety requirements. 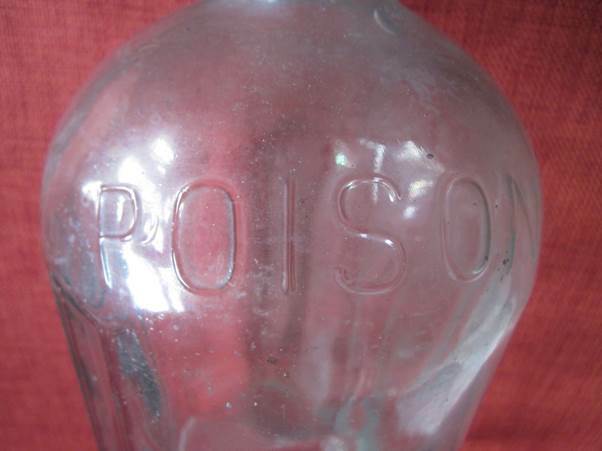 It maybe isn’t as bold as it should be and certainly has no internationally recognised symbol for poison. This bottle is a relic from my long ago days of being a bit of a scientist. It was a chuck out from one of the labs. I think it is an elegant item, but let me emphasise, yet again, I do not collect bottles. I do not want any more unless they have some real resonance in my life. 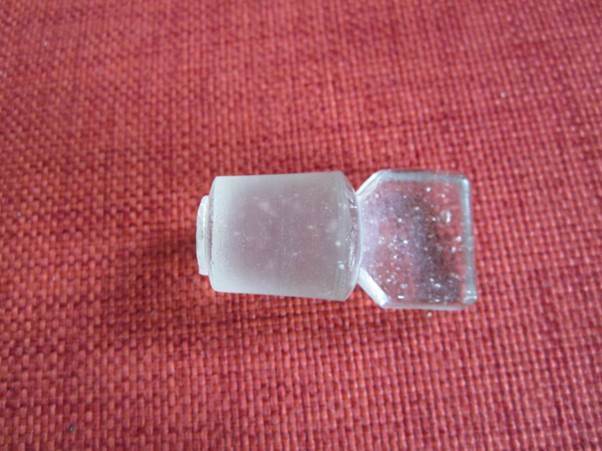 One of the things I really like about this bottle is the perfect closure obtained with a ground glass stopper. Precision engineering is needed to produce the perfect fit with the neck of the bottle. Wonderful! I’ve said it before and I’ll say it now. I am not a bottle collector, but I tend to keep those that come my way which seem interesting to me. Having said that, I’m not sure why I have this one. I certainly wouldn’t have bought it. I just don’t buy bottles. 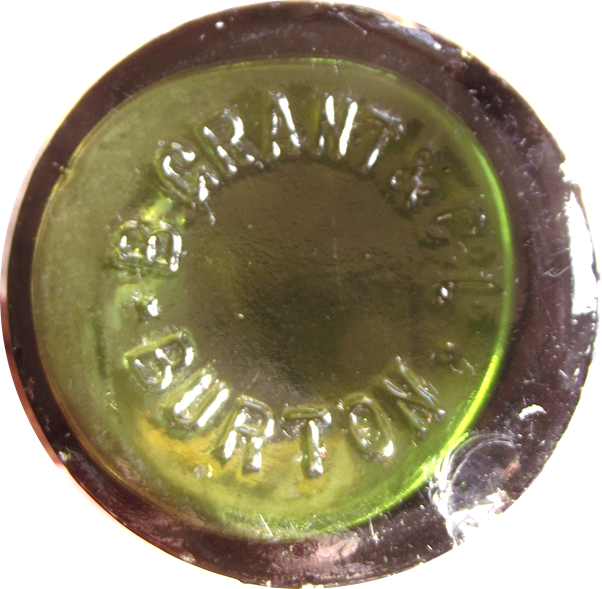 This is a simple green bottle which has been machine blown in a mould.OK, it looks brown on an orange background in bright sunlight. I chose that location to get a shadow on the embossed writing. I can’t date it but maybe somebody can. It carries the simple legend, ‘Invercauld’ scrawled around it. Invercauld is a place and castle near Braemar in the Cairngorm National Park in Scotland. This could point to this being a whisky bottle. I can’t abide whisky. In truth, I hardly have any alcoholic drinks, but if I have a food principle it could be not to refuse anything as a matter of principle. But I certainly get no pleasure from spirits. This bottle has a manufacturer’s name embossed on the base. As soon as I see burton, I think ‘brewing’. Can anybody out there tell me anything about this bottle? I have said before, I do not collect bottles, but somehow some arrive with me. 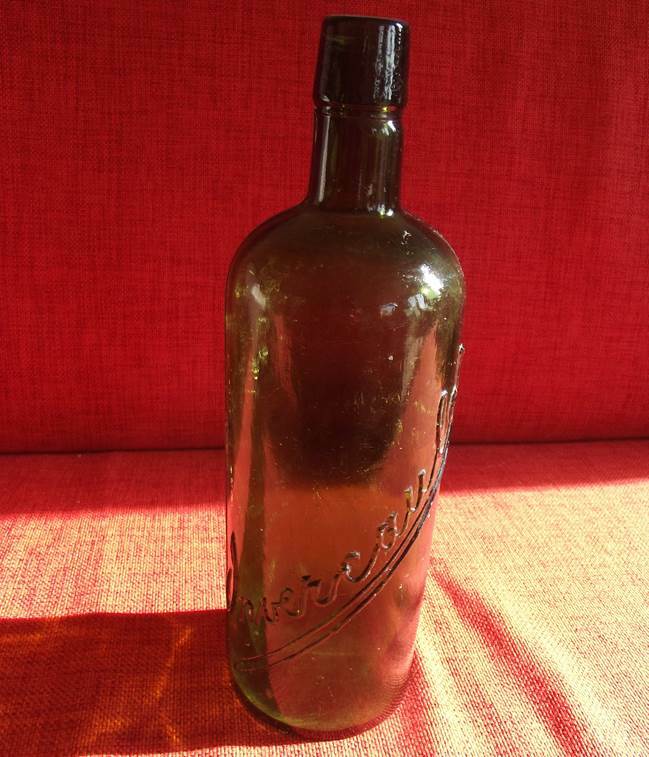 Actually, I do like old glass bottles, mostly because they have writing on them, produced when the bottle was moulded. 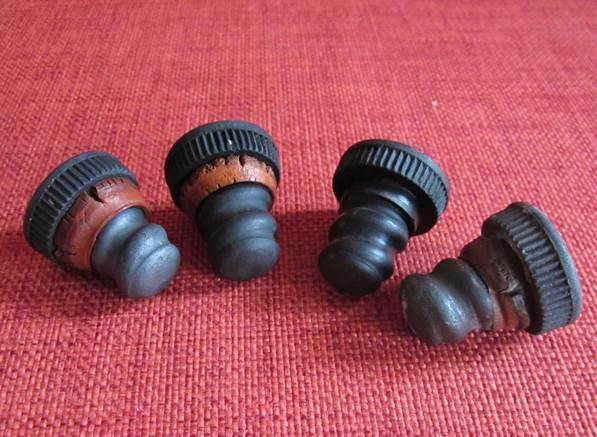 I also rather like screw-in stoppers – assuming they have writing on them. Here’s a little collection of mine. The bottles have the matching thread moulded into the neck. The rubber washer on the stopper (perished or missing on this collection) ensures a tight seal. But as I say, it is the writing which makes them interesting so lets take a look. This one was from Simonds of Reading. This brewery started business in 1785 and remained in production until the 21st century although name changes had taken place before then. 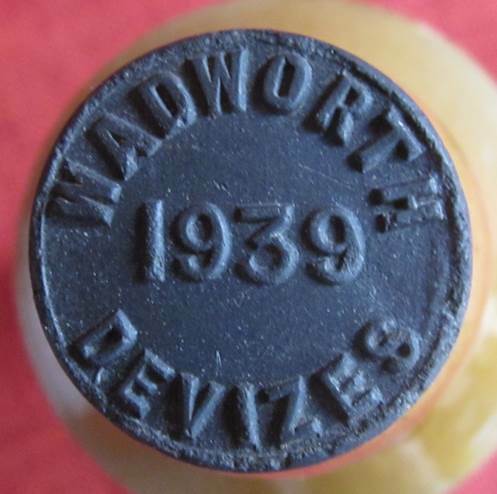 More interesting to me is a Wadworth stopper. Wadworth are the local brewer still running under that name in Devizes, our local town. Two of the stoppers have this on top. I can only guess that 1939 might be the year they were made. Maybe somebody could tell me more. So to the fourth of the stoppers. 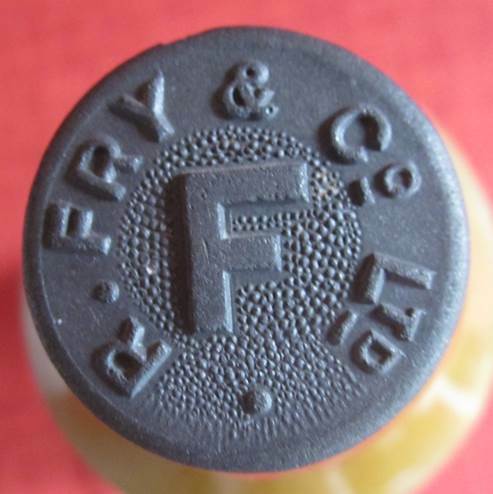 R. Fry were manufacturers of aerated mineral water (fizzy pop to us) and based at Tonbridge Wells in Kent. This is the correct stopper for the bottle I have used to photograph all of them. 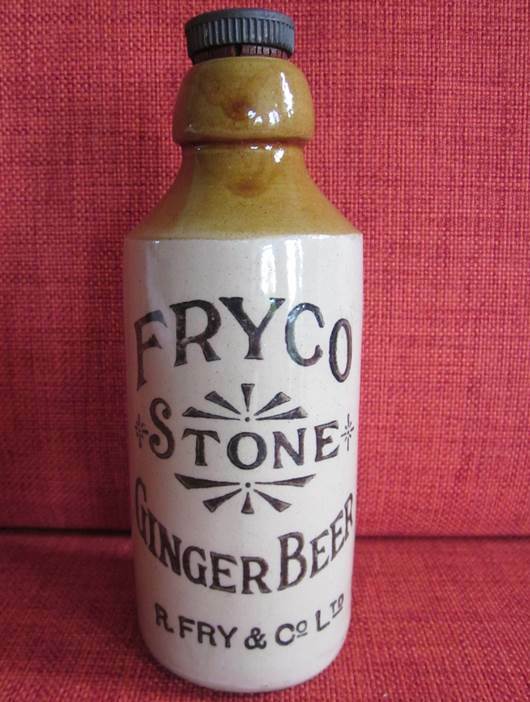 It’s an earthenware rather than a glass bottle. I find it an interesting little collection. I am not a bottle collector. I certainly don’t buy bottles. So how come I have more than fifty of them? The answer is that I might dig them up, or I just find them, or other people give them to me. If things are given to me, I tend to keep them. Today I am looking at a bottle which once contained ‘Camp Coffee’. I do not find glass bottles the easiest thing to photograph. By their very nature they are a bit see-through. But here goes. The jar says very clearly that here we have Ess (essence of) Camp Coffee, with the two words sharing the initial letter C, and chicory. Now my dad might have been described as a coffee snob. Even in times of poverty, he would seek out the right beans which he (or often we children) would grind in a hand powered mill. Contraptions would then gurgle and hiss on the ancient stove, producing a liquid so strong and utterly foul tasting. Dad loved it. I think it is a wonder I still drink coffee at all. It was truly awful to my young taste buds. But Camp Coffee didn’t suit dad at all. Essence of chicory was no substitute for the real thing in Dad’s eyes. Maybe he just couldn’t get it to the right strength – or maybe he really did have a need for caffeine which chicory doesn’t provide. Actually, Camp Coffee was 4% caffeine. We kids loved the bright labels on the bottles and certainly felt that a bottle of the stuff should go camping with us. It must have done sometimes otherwise we wouldn’t have known about it. Camp Coffee was first made by a firm called Patersons in the 1870s. The Glasgow firm produced it until 1974. Then they were taken over, but the drink is still made today and finds much favour with bakers of coffee cakes. My bottle is, I think, an older one since it has no method of fixing a screw top and so must have been closed with something like a cork.